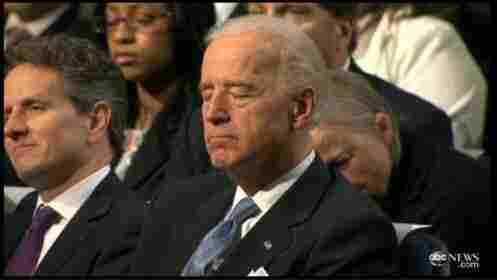 On The Lighter Side: As Obama Spoke, Biden Rested : The Two-Way ABC News caught the "action" this afternoon as Vice President Biden appeared to nod off for a moment during President Obama's speech on deficit reduction. ABC News' caught the "action" this afternoon as Vice President Biden appeared to nod off for a moment during President Obama's speech on deficit reduction. And if you look closely, he wasn't the only one: the young woman behind and to his right does a bit of dozing herself. Of course, they probably knew what was in the speech. And falling asleep is a bipartisan thing to do, as Republican Sen. John McCain of Arizona has proved. For all of NPR's much more serious coverage of the budget and related matters, click here. And we live-blogged the president's address.